1. Be savvy at the Garden Bar. Nutritionals aren't available for most of the individual items, but stick with fresh veggies and you'll be in the clear. The dressing stats are given, which is awesome! Top picks: Balsamic Vinaigrette (40 calories, 2g fat, PointsPlus® value 1*) and Lite Ranch (70 calories, 5g fat, PointsPlus® value 2*). These numbers are for a 1-oz. serving, about 2 tablespoons. 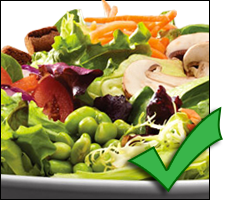 Click here for some general salad bar advice! 2. The stats given for starters? Those are for 1/4th of an order, not the entire dish! Sharing the Asian Dumplings with three pals? Great choice, at only 64 calories and 2g fat per serving (PointsPlus® value 2*). Getting the Shrimp Fondue? A bit dicey at 306 calories and 19g fat per serving (PointsPlus® value 8*)... and double that if you're splitting it with only one other person! 3. If you're planning to have some snacks at happy hour, BE WARNED. Each bar-menu taco has 329 - 406 calories and 20 - 26g fat (PointsPlus® value 9 - 11*). ACK. We suggest having a smart snack before heading out for the night. 5. Brunch: It's baaaaaad neeeeews. Sorry to be the Bummer Patrol, but it's a limited menu and, well, the omelettes each have 1,102 - 1,376 calories and 44 - 63g fat (PointsPlus® value 17 - 23*). Just host an HG-style brunch instead! 6. Fit & Trim menu items are your friends! The label means a meal has less than 700 calories when you order it with the Fresh Grilled Zucchini and Roasted Spaghetti Squash sides. That said, don't discount an item just because it DOESN'T have the label. There are other gems too... Keep reading for proof! 7. Don't ignore the specials... RT's is REALLY good about posting stats for everything. YES, even the limited-time-only Feature Menu. And sometimes those stats are surprisingly low, so read up before you assume LTO items are off-limits. 8. A word about desserts... You could get a cookie for 180 - 200 calories and 9 - 12g fat (PointsPlus® value 5 - 6*), or a cupcake for 285 - 325 calories and 11 - 16g fat (PointsPlus® value 8 - 9*). But any other single-serve dessert would cost you 535 - 820 calories and 23 - 60g fat (PointsPlus® value 15 - 24*). Frankly, we'd prefer an HG dessert at home! Tilapia is a fantastic protein pick, so we love seeing it zazzled-up with flavorful ingredients instead of heavy sauces. Just select some smart sides from our list down below. We think this would go great with the grilled green beans and the tomatoes with balsamic vinaigrette... That meal would clock in at an impressive 362 calories and 13g fat (PointsPlus® value 10*). Salad sadness. What are the culprits here? Fried chicken tenders, cheddar cheese, bacon, and croutons. "What about the dressing?" Here's the kicker -- these stats do NOT even include the dressing! Yikes. YUMSVILLE. To get the above stats, pair the BBQ-glazed chicken with sides of zucchini and spaghetti squash. A similar Fit & Trim option? 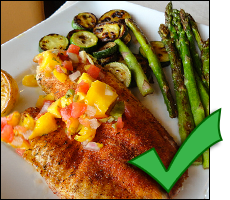 The Hickory Bourbon Salmon, with 485 calories and 23g fat (PointsPlus® value 12*). Not bad! Don't let the broccoli blind you! All that penne and a Parmesan cream sauce cause the calorie and fat counts to skyrocket. Nearly 1,500 calories and over 90 grams of fat for a plate of chicken and noodles? UGH. Couldn't be less worth it. Who says steak can't be a sensible selection? This pick is perfect. (The Top Sirloin is also a good one!) Order it Fit & Trim style, with grilled zucchini and spaghetti squash, to get the above nutritional numbers. Or take your pick from the other guilt-free side dishes! No, no, no. Just NO. And these stats don't include any sides whatsoever. Oy vey! We love this pasta swap of a meal! It features a red-pepper marinara sauce and tasty zucchini. 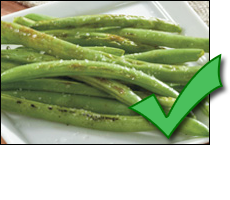 Pair it with a smart salad from the Garden Bar -- refer back to the TOP ATE for tips! Check out all the great options! HG FYI! Most of these veggies are prepared with some margarine, butter, or oil (thus the fat counts), but many can be served up without it. Just ask nicely, of course! Check out the Skinny Mojito and Skinny Patrón Margarita, each with 150 calories or less! As for the rest of the bar beverages? 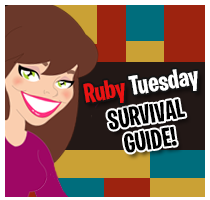 All the usual rules apply... Click here for our Happy Hour Survival Guide! Now's the perfect time to pass around this treasure trove of nutritional info. Click "Send to a Friend" ASAP! This Monday, May 27th, is Memorial Day. (There'll be no HG email that day, but we'll be back Tuesday with a cake swap!) Click here for a massive Memorial Day recipe roundup, and click here for guilt-free cookout tips!